This recipe has been done by a lot of cooks out there, each with their own twist. I chose the traditional way of making it, Lentils, Carrots, Fire Roasted Tomatoes, Garlic, Onions, Celery, Parsley and of course the Hot Sausage. It’s a healthy and yet warming dish for the cold weather. Lentils are known to bring luck; so hopefully by making this dish I am sending some my way. You should try it out and see what comes of it. I don’t usually post my recipes unless requested, but I figured I would share this with you. Place lentils in a pot and cover with stock and at least 1 inch of water, then add bay leaves. Bring the lentils to a boil, reduce heat a bit and cook at a low boil, about 40 minutes until tender. Drain and remove bay leaf. Before lentils finish cooking place a skillet on stove and add Olive Oil, 2 tablespoons to the pan, and heat over medium-high heat. Add carrot, celery, onions, and season with salt and pepper. Cook 5 minutes then add garlic and cook a couple of minutes more. Stir in tomatoes, season with cloves, cinnamon and red pepper flakes. Add white wine to Vegetables, stir in parsley and lentils. Then adjust the salt and pepper if needed. Preparing the sausage I coat the casing in a bit of Olive Oil and set the sausage up on top of a baking sheet. Preheat oven to 400 ˚F and roast sausage 20-25 minutes until firm and cooked through. 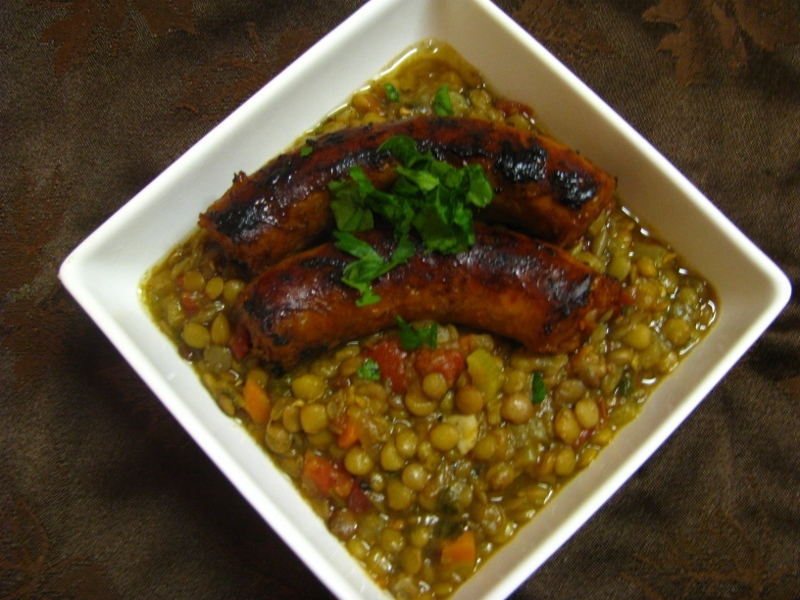 Serve lentils in bowls topped with sausage and Parsley. Thanks so much for this recipe! How did you know that we’ve been craving lentils in the past few weeks? We can’t wait to try this. Now that I think of it, I don’t recall every having lentils in my life. Part of growing up in rural America I guess. All fried chicken, mashed potatoes, and gravy out this way. I’m putting them on my list to try though. I think there’s a lentil soup to make as part of this project I’m on. This looks delicious – am definitely going to try it very soon on my sausage-mad family! Hey, Thanks for sharing and liking the recipe…if you could do me a HUGE favor click on the link http://greaterdc.wholefoodsmarketcooking.com/recipes/12537_lentils_hot_italian_sausage and leave a comment….that would be wonderful…BTW checked out your webpage and the recipe looks AWESOME.